Ms. Viola Davis (How to Get Away With Murder’s star), we bow down to you. 4. And you wondered: In what world do law professors wear sporty, red leather jackets to class and sleeveless sheath dresses in the courtroom? 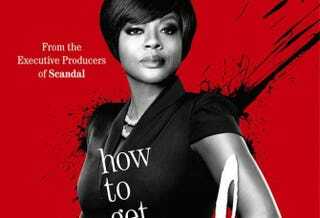 And you quickly learned the answer: in Annalise Keating’s world. But you knew that, for as cool and composed as Annalise appeared to be, there was something not quite “together” about her. Her wig selection was a dead giveaway. 5. HTGAWM let you know what time it was straight out the gate when you saw Annalise receiving “oral pleasures” on her office desk from her strapping sidepiece, Nate, in the very first episode. 6. Then a New York Times TV critic, talking out the side of her neck, referred to Rhimes as an “angry black woman” and Davis as “less classically beautiful,” and Ms. Shonda had to get her together real quick. Ms. Viola let the world know that she can’t be torn down because she knows who she is, and the Internet joined them in collectively showing the door to that New York Times critic and her retrograde commentary with think pieces and hashtags like #lessclassicallybeautiful. 9. Then Davis became the third woman of color to win the Screen Actors Guild Award for Outstanding Performance by a Female Actor in a Drama Series and delivered an emotional acceptance speech, giving a little something to both her fans and her haters, in her trademark above-the-fray way, of course. For the record, the only other women of color to win this award also came from Rhimes’ Shondaland. They are Sandra Oh for Grey’s Anatomy (2005) and Chandra Wilson for Grey’s Anatomy (2006). 10. And, finally, the time that the legendary Cicely Tyson, who has been consistently cited by Davis as one of her idols, showed up and showed out as Annalise Keating’s mother, Ophelia, on HTGAWM. Ms. Ophelia arrived on the scene to shake Annalise out of her “my husband’s dead, and I just framed my black boyfriend for his murder” funk. What are some of your favorite moments from HTGAWM so far?